Friday Funny? Meet the new spokesperson for 'I Heart Climate Scientists' | Watts Up With That? This ranks right up there with Heartland’s blunderous Unabomber billboard. Are they irony impaired, since Jason is fictitious? I wonder, do climate scientists really want Jason as a spokesperson for zealots to show their love? Inquiring minds want to know. December 13, 2013 in Ridiculae. Do they even get the irony? Jason is a fictional character. No reason to worry about him at all. The Unabomber is a real person that killed real people. Jason is a fictitious character that killed fictitious people. Shame we don’t have global warming. Ah, Jason Voorhees. Good choice. I can see they excel in fiction. Jason is more logical and amenable to a civil debate on the scientific facts than these folks. Hmmm, why not a picture of the snow falling today in Cairo? Real scientists have every right to challenge this slur on their good name. No, nightmares are caused by Freddy Kreuger, which was the “Nightmare on Elm Street” horror franchise, not the “Friday the 13th” franchise. These guys can’t even keep their pop culture references straight. These guys are getting good at a fiction. First Santa Claus, now Jason. Funny, at first glance I read that as “I hate climate scientists”. Apart from that, I have no idea who Jason is/was so the whole thing is lost on me. Well Anthony, that seems the point they’re making. “Jason’s” fictitious. CAGW’s all too real. The weakness lies in the very fact they have to say it, the implicit acknowledgement being that many people don’t believe it’s real. If the weight of scientific evidence means that we are really near the beginning of the end for the CAGW scare, the proponents will probably get a lot nastier before it is all over. Many have a great deal invested in careers and will be aggressive in protecting them. For others it may only be their self-delusion of choice, but some people will defend religion with violence. The mentality of a 17 year old halfwit. Maybe Josh can do something along the thought of “Truth, the Reality that Ate AGW”. Truth can be substituted with Facts, Data, or a few other terms. I thought they had SuperMandia? Couldn’t he take on Jason? So stupid, I am now dumber for having read that. 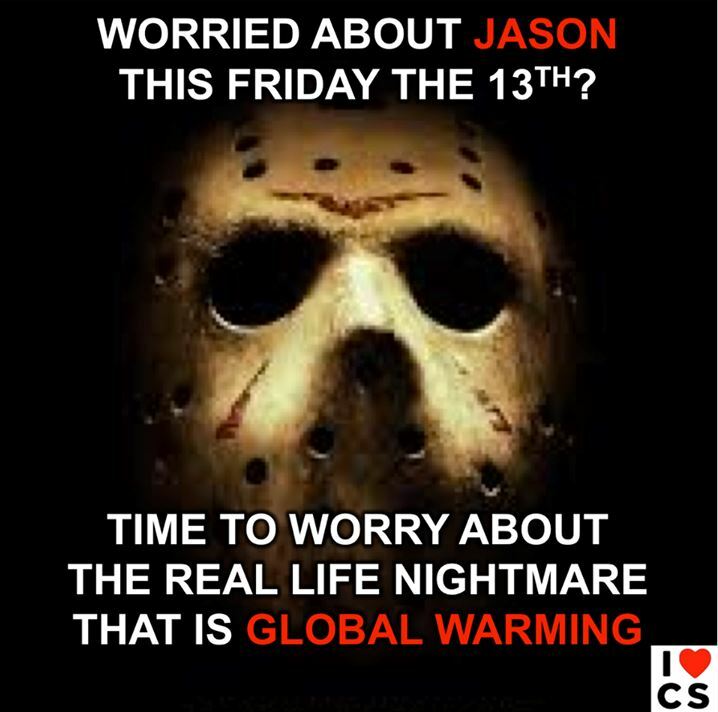 Will iHeartClimateScientists have to pay royalties for using the Jason image? Who funds iHCS? Maybe they are syphoning off money for their warmunist buddies in Hollywood. Jason is a good spokesperson. He butchers, they butcher (10-10 ad???). If you count all the holes they have drilled in the skull it still doesn’t exceed the number of holes in their argument. If I may suggest, perhaps a poster of “Dumb and Dumber” may have been more appropriate? But enough about Belgium’s new euthanasia policy for children – how about those Broncos? There is not a Bus short enough for those Morons. Does a hockey stick go with that hockey mask? Nope, no alarmism there. Just good sound scientific reasoning. Just hope it’s not too technical for some people. …… Nor is there a full-body Helmet suitable to their need. Lot of competition for the Friday funny have you seen this graph? This may be unrelated but I just saw Henry Winkler on a tricycle. Does the hockey mask mean they’ve finally given up on the hockey stock? When your science fails you, resort to fiction! Makes perfect sense to me. CAGW is indeed very frightening, much more so than Jason, because many policy-makers who recognize Jason as a fictional creation, have great difficulty applying the same logic to CAGW, and that failure is leading to considerable harm to economies, landscapes and highly vulnerable people in both developed and developing nations worldwide. Jason can only hurt people one at a time. Bad policy is a weapon of mass destruction. Not recognizing much of the dogma of global warming as an unproven, and in many cases disproven theory is creating huge damage. Friday the 13th is a superstition that persists in the minds of old wives and in their tales. Jason is a fictional character confected to frighten those who want a quick fright and dont mind paying for it. Is there a learned prof from australia out there who can study the ideation behind this ? Friends in Yellowknife (Arctic Canada) have been in bed the last couple of days trying to stay alive – with the windchill factor temp is 48˚ below, without WF it’s minus 40˚. Nobody remembers this esp so early in the winter. It’s worse than that, Anthony. Jason is a fictional character who was invented to make money for his creators. That poster absolutely reeks of irony. Sam the First, someone has a short memory. This is perfectly normal weather for this time of year. Calgary has already seen -30, and we’re far south of Yellowknife, but on December 12-13, 2009 we saw -40. To be honest, if you’re in Yellowknife and a mere -40 with a slight breeze is horrifically cold to you, you probably should move south. Still, it beats Greenpeace’s Grunge Santa. Why hasn’t anyone done a parody of that ad? There’s Santa, afraid and in the dark, not because of ice melt but because NRDC, Greenpeace, and the Sierra Club have cut off his power. The Greenies insist his workshop run off solar power even tho’ it’s night at the North Pole for half the year. He’s written letters to all the heads of the Green movement, but gotten no reply so now he must put something in their stockings that they fear the most, a lump of COAL. Now that would be funny. So now we know who to vote for …. …. the politicians who promise to reduce Earth’s temperature the most. We can only hope that it follows the premise of “Friday the 13th Part VIII: Jason Takes Manhattan”. Major scenes to filmed outside Tom’s Restaurant. So the loveable climate scientists will hack you to death if you do not give them more money. Perhaps they are trying to frighten to older children, seeing as how nothing else is working. Good lord, how long ago were the Friday the 13th movies? How many people under the age of 30 even know who Jason was? @Tim Maguire- Have you forgotten “Freddy versus Jason”??? Take nitpick aside, Jason is ther perfect spokesfigure for CAGW – the Hockey Mask fits with the Hockey stick and both the mask wearer and the stick are works of fiction. -48C not too big a deal here for a couple of days,, when it goes below -50C and stays then the dance of the fuel trucks begins. The air is dead calm,very clear, every house has a shaft of heat rising straight from its chimney , very few vehicles about except the fuel trucks. And of course the eco-ntz are getting zero power from their alternate energy schemes, cause it is dark and still. The detail of that report shows it is about 3,000,000,000X rarer than CO2, so 7,000X more potent still means it’s about 400,000X less important. And since CO2 is already climatologically trivial, it’s asymtotically equivalent to zero in significance. No, they are both fictitious, but at least Jason shows up in movies. CAGW isn’t showing up anywhere at all! Don’t really like to defend them, but I think that’s their point – Jason is fictitious, but to them global warming is “the real-life nightmare.” Ooh, I’m really scared now. Let the bed-wetting commence. The detail of that report shows it is about 3,000,000,000X rarer than CO2, so 7,000X more potent still means it’s about 400,000X less important. And since CO2 is already climatologically trivial, it’s asymtotically [sic] equivalent to zero in significance. Why are you bringing up facts? Do what the warmunists want you to do and PANIC!!!!!! Add a goatee, or a van dyke, make the eyes just a tad beadier, and who do you think that looks like? In defense of Heartland, I never thought their Unabomber billboard was all that blunderous – their point was simply that if a nutcase was so easily hooked into CAGW, then normal folks ought to re-examine the topic with a little more critical thinking. 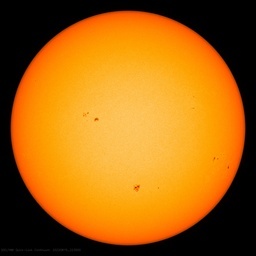 The message from iHeartClimateScientists gets lost because many people worry about superstitious bad luck incidents happening on this date, not lurking psychopathic murderers. Hmmmmm…. maybe there’s something to global warming after all. Almost fell out of my chair laughing! Hey man, you are a genius! Jason wasn’t the killer. Jason’s Mom was. @Steele – Unfortunately after that, the twist was lost. and they devolved into mindless slasher movies. That is what redeemed the original. says — No, they are both fictitious but at least Jason shows up in the movies. CAGW isn’t showing up anywhere at all. Sorry but you are wrong. CAGW shows up in Al Gore’s movies. Hey, we have produced plenty of loonies of our own, but Lewandowsky is American. He roosted here for a bit, and has now decamped to the UK. It is almost as though he has to keep moving, for some reason. I’m glad they called it global warming at the bottom, we should never allow them to call it anything else. I’d bet there are more unicorns than genuine climate scientists. The comments following this article are priceless! Heartland’s Unabomber billboard wasn’t “blunderous” –it was a Bull’s Eye. CAGW propaganda on massive scale is no less dangerous than terrorism on individual scale. I commented on their Smokey the Bear, Dr Suess catastrophic drought, and deniers/snow posts. We will see if the comments remain. I Heart Climate Scientists is long on snark, short on data or studies. Hey, if they like Jason as their spokesmodel, why is Heartland so off the mark in pointing out that consensus includes other whack jobs besides Mann? It’s always hilarious how they try to claim “victim” status, and even attempt to portray themselves as the “David” in a David and Goliath type struggle, when clearly the opposite is true.